He's a ramblin' wreck, was drawn by Don Heck, and a hell of an Avengeer. Er, Avenger. Sorry. Scientist Hank Pym discovered a sub-atomic particle that allowed objects to shrink or grow in size and became the heroic Ant-Man. Years later, as the stress became too much for him, he developed a second personality, the cocky, brash Yellowjacket. This one was originally an ML Namor with a sculpted mask and vinyl wings. 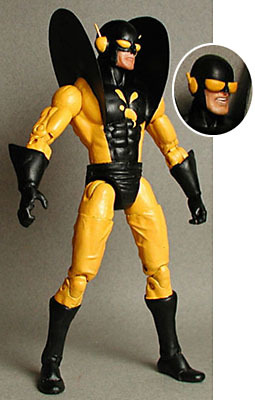 For an angrier Yellowjacket, use the ML Nick Fury - it's the same body, but the snarl on his face makes Hank look more deranged, as he was when he first used this costume. What's your favorite alter ego for Hank Pym? Tell us on our message board, the Loafing Lounge.